To ensure a safe environment for the transportation of students to and from their schools, operating in a timely and predictable manner. When using FIND MY BUS try the first 4-6 letters of your street name if you are having difficulty finding your street. Please click the link on the left and follow the directions. Please be aware that our buses will now be numbered from 1 thru 460, plus our special needs vehicles. Parents are reminded that students are assigned to a specific bus AND a specific bus stop. Drivers are not authorized to move bus stops. Your bus driver is not authorized to pick up or drop off students at other bus stops or other locations at any time. In a family emergency, the school principal may issue a "one-day" AFTERNOON Emergency Boarding Pass for the student to be dropped at another location. Vacation and work travel do not fall under the provisions for the issuance of an Emergency or a Temporary Boarding Pass. The majority of our buses carry a full load of students. When your child stays with another family, the host family is agreeing to transport your child to and from school. Kindergarten and first grade students must be met at the bus stop by a parent/guardian/ responsible adult or responsible older sibling. If no parent is available after a series of attempts to drop off, the driver will contact the school and transportation office and the child will be returned to school per school board policy 810. All special needs students are to be met by a parent/guardian/responsible adult or responsible sibling unless prior arrangements have been documented. 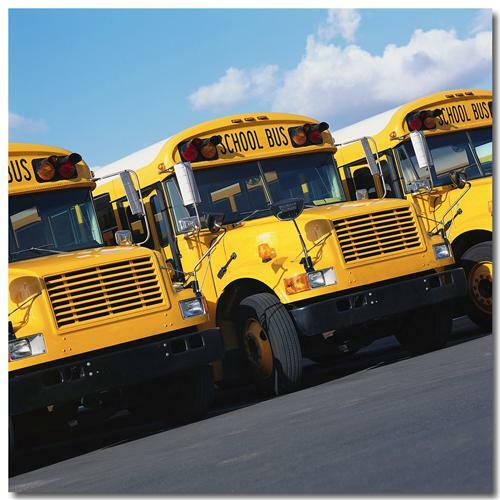 The school district policy for audio and video recordings on school vehicles is Policy 810.3 . In case of Emergency, Press "1"
To Report a Student Absence, Press "2"
To Report a Safety Concern, Press "3". If not answered please leave all pertinent information and you will be contacted within 1 business day. For General Transportation Information, Press "6"
To Report a STAFF absence, Press "7"
For a dial-by-name employee directory, Press "9"
To REPEAT the menu, Press "8"
To reach an attendant, Press "0"
The transportation department opens daily at 5:30am and is staffed until 6pm on school days. Staff is limited to answer phones until 8am abd all phones are answered as quickly as possible. Our phone lines are monitored throughout the day for messages. Non-urgent calls are suggested between 8am and 4:30pm on school days.